Ghost is a free, open source and lightweight platform intended for blogging or online publications. It is written in Nodejs and comes with an assortment of modern publishing tools designed for easily building and running online publications. It is feature-rich and now has a desktop app (runs on Linux, Windows and Mac OS) which provides all the functionalities and power of Ghost, simply on your computer. This implies that you can easily switch between multiple sites on the go: making it absolutely efficient. In this article, we will explain how to install an open source Ghost (Content Management System) blogging platform on a Debian and Ubuntu system. 1. Nodejs is not available in the default Debian and Ubuntu software repositories, therefore first add its repositories and then install as follows. 3. Now create a Ghost root directory which will store the application files in the /var/www/ghost, which is the recommended installation location. 4. Next, grab the latest version of Ghost from Ghost’s GitHub repository and unzip the archive file into the directory you just created above. 5. 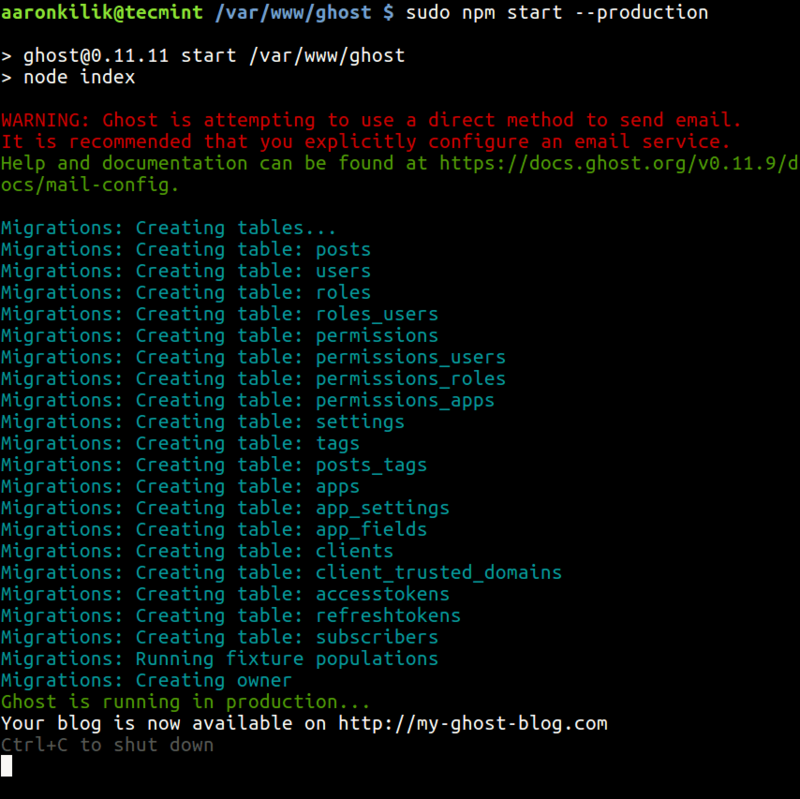 Now move to the new ghost directory, and install Ghost (production dependencies only) with the below commands. Note: After launching Ghost for the first time, the file config.js will be created in the root directory of Ghost. You can use it to set environment level configuration for ghost; where you can configure options such as your site URL, database, mail settings etc. 9. In this section, we will install and configure Nginx to server our Ghost blog on port 80, so that users can access Ghost blog without adding port :2368 at the end of the url. First stop the Ghost service by hitting the CTRL+C keys on the terminal and then install nginx as shown. 10. Once nginx has been installed, create a new file under /etc/nginx/sites-available/ghost. 11. Now open /etc/nginx.conf file. include the configuration files in the sites-enabled directory and disable the default site as shown. That’s all! In this article, we showed how to setup Ghost in Debian and Ubuntu. Send us your queries or any thoughts concerning this guide via the feedback form below. That is Ghost pro, if you need sophisticated features then you need to pay a few dollars. But is free with a handful of features. All in all, thanks for sharing your concern. you forgot to mention on how to keep ghost server running forever in the background as service. Oh sure, we will update th article to include this important step. Thanks for the heads up.